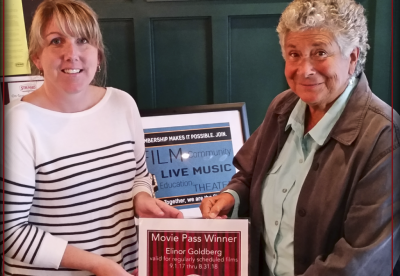 Elinor Goldberg was the winner of a pass good for free movies for a year! Her name was drawn as part of our Summer Membership drive -- all those who renewed or upgraded their Membership by the end of August were eligible. Congratulations Elinor! Pictured with Elinor (right) is Strand Membership Coordinator Jessica Ripley.